2nd gen about ready for testing! It sure is compact now. 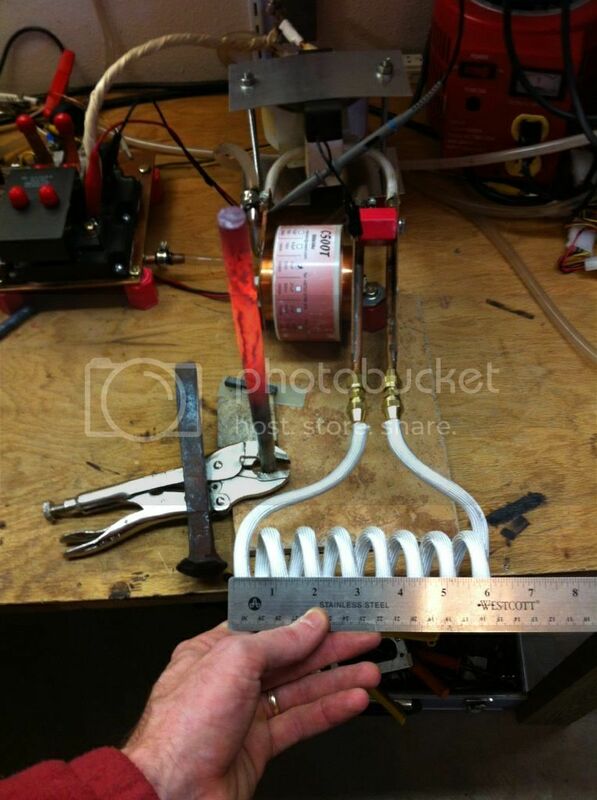 6" x 1.5" coil heating 1/2" bar. The fiberglass tubing to protect to coil did not hold up well to the heat of the metal, anyone have any suggestions for a tough, heat resistant coating? maybe some kind of dip coating? Why does it need the fiberglass - commercial ones I have seen on videos do not appear to have any type of covering visible. It doesn't need it, but it looks nice. Some commercial coatings (definitely dipped) act as insulators so you can't short the coil. I'm not sure how necessary. You might ask courtiron about the siliconized sleeve he uses for his coils. 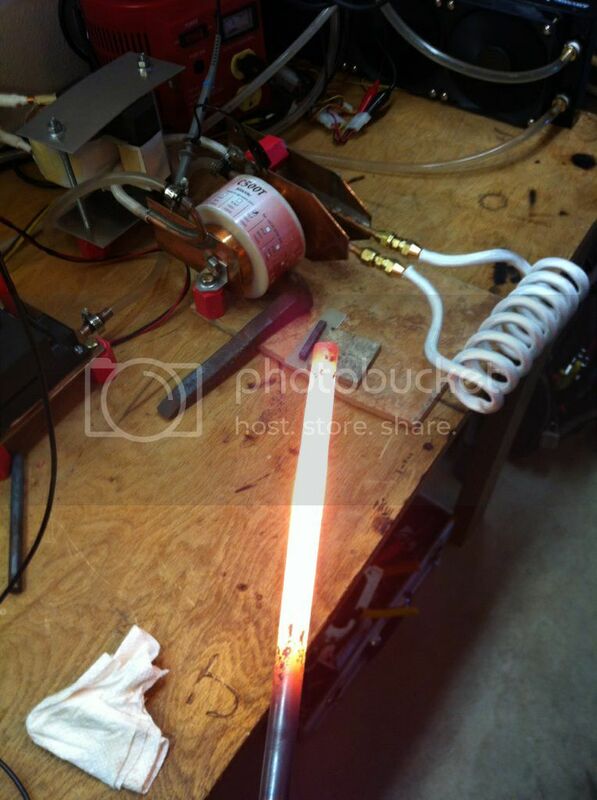 See the thread "Where o where induction forge" where he discusses it and his coils in more detail. Thanks, I check through his thread. Shorting out the coil doesn't have any negative effect really, other than making you jump a little sometimes. Search around for a DIY ceramic coating for car exhausts. Tech Line has one that in theory is rated up to 2000 degrees. There is also Swaintech and Jet-Hot, but I don't know if they will let you purchase just the ceramic coating without going through them to apply it. sometimes I wish asbestos didn't kill you...perfect application. Looks good! What would happen if the bar you were holding in there with your hand toched the side? It would spark, about like touching the connectors of jumper cables together that are hooked to a car battery. Definitely interested. No roar like propane, mess like charcoal/oil/coal and no smoke (except for the little that comes off the metal as it starts to heat. Nice. one idea to be able to make the case of the machine totally air tight is to have it filled with mineral oil it will disperse the heat and and it have been used in highly over-clocked computers and such but will would mean a mess if something broke but maybe ?? Greg, yes we have thought about dust and such, not sure how it will be addressed yet. Filters may be possible since there will really not be much cooling needed compared to the machines out there now. Mineral oil is neat, too messy and impractical though. 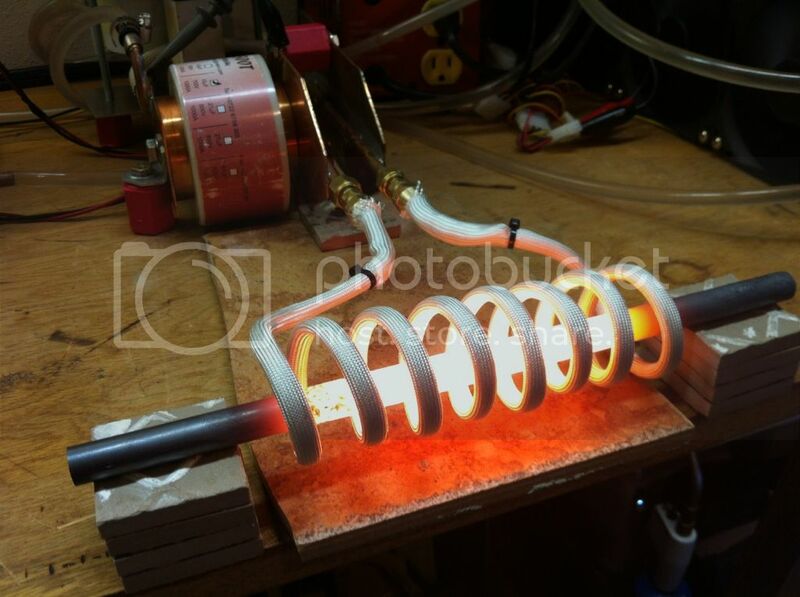 i can say, i really love my induction heater and would really hate to do without it.... marvelous machine !!!! 2. In many shops cooling water will be a freeze hazard if not a heated shop. A 50:50 mix of PURE ethylene glycol and distilled water in a recirculating cooler will give very good performance and will be very freeze resistant. DO NOT use automotive antifreeze, the additives make a "Black goo of death" in induction systems. 3. In the forge and machine shops I have worked in furnace filter media is required over the intakes for the cooling fans, the dust shortens life badly otherwise. Black goo of eath? If it happens how is it removed or overcome? The "Black Goo of Death" is found after regular ethylene Glycol is used in induction heaters. Something in the additive package undergoes some sort of bad change and the stuff coats out on everything copper. In the big industrial machines, the power cables are braided copper run inside cooling water hoses, and the capaciters are usually water cooled as well. 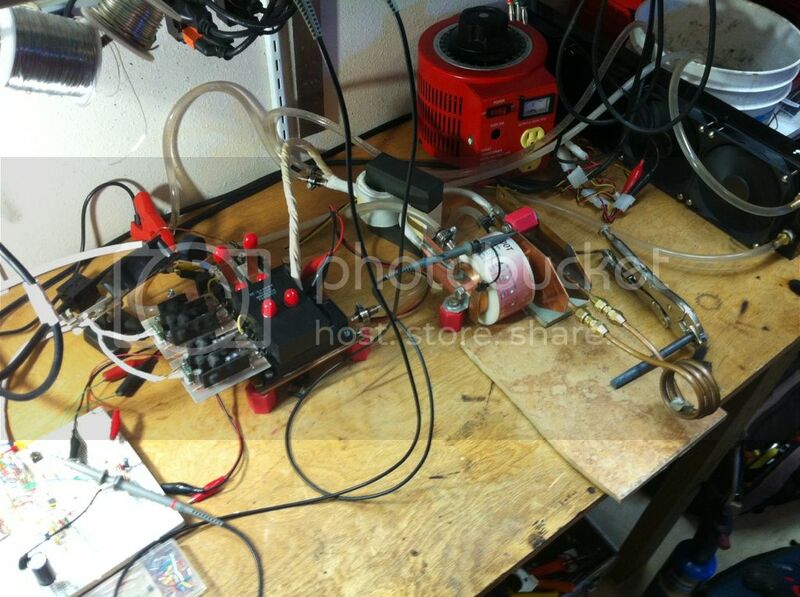 The goo blocks coolant flow and cables and Capacitors rapidly fail. Seen it happen twice, at 2 different forge shops were the wrong product was ordered or supplied. I learned to specify, and inspect before use that "Technical Grade Ethylene Glycol" was used. To my knowledge we had to replace the cap's and cables as there was no fix. By the way hard water is ALWAYS bad in induction systems. The calcium Carbonate is a very strange compound having properties very different than intutive. Unlike the sugar you put into your coffee calcium carbonate's solubility decreases as the water temp increases. It also does not precipatate, but rather plates out on the hot surface. This leads to a coating on the inside of the tube in the coil that insulates the copper from the coolant, leading to early failure. Since the cooling system on a home sized unit should not be over a couple of gallons, distilled water would be a reasonable investment. We used big dionized water generators to make out coolant water as we had units holding several hundred gallons. We also had the D.I. units for use in making up machine coolant anyway, so cheaper then distilled. In the post above the regular Ethylene Glycol I reffered to should have been Regular Ethylene Glycol anti-freeze as used in cars. Any of our forges (other than future 3 phase units possibly) shouldn't need more than 5 or 10 gallons of distilled water and can be kept above freezing with a tank heater in the reservoir or by leaving a pump running to keep it flowing. 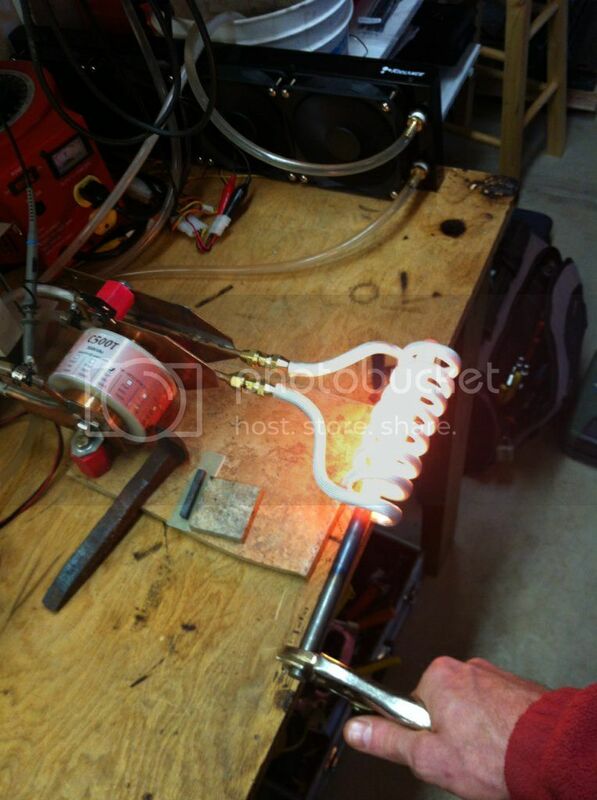 I have an electric heater in my shop to keep it above freezing in there so I can work. My cooling set up now is a 5 gallon bucket, fountain pump, and a 5"x22" radiator with 4 small fans, I use it a lot and It works perfect for such a simple setup. I don't heat much material thicker than 1" for now, when I start I may need a 2nd or larger radiator. Thanks, ptree. I don't know right now where to get the good stuff, but will look around. Most chemical wholesale outfits and some oils jobbers that supply industry may be able to supply John. I think there are some comercial coolants for induction heaters as well, I will check tomorrow if I get a chance. Those you may be able to get in smaller size as well. 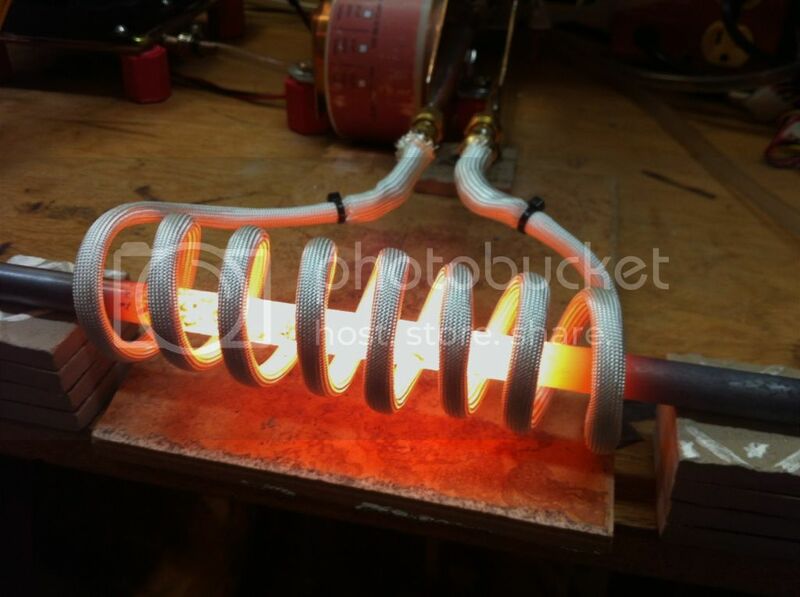 Id like to know of any induction heater specific coolants as well, make sure you post them here.